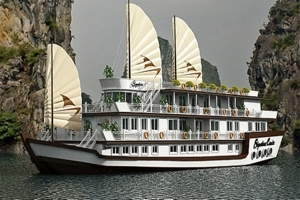 07:45 Your transfer vehicle will pick you up from your hotel and start departure to Halong Bay. 12:30 Arrive at Tuan Chau Pier. Transferred by tender to Galaxy Premium Cruise. 12:45 Welcome onboard - enjoy welcome drink and follow Manager briefing safety on board. 13:00 Check in your cabin and freshen up. 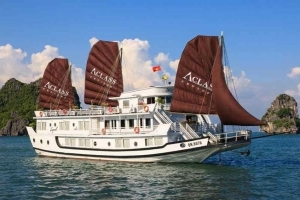 13:30 Delicious lunch will be served with fresh seafood and Vietnamese cuisines while leisurely cruising to the core of Halong Bay. 15:30 Arrive kayaking area - Dark and Light Tunnels, belonged to Cat Ba National Park. Enjoy kayaking through the karst and breathtaking nature. Then you can enjoy swimming in the crystal water (life vests are available). 17:30 Get back to Galaxy Premium, cruise to the overnight anchorage. 18:00 Let’s start Sunset party on Galaxy cruise. Great time to relax, have some drinks and make friends. 19:00 Impressive dinner will be served with set menu. 20:30 Free time for joining games, playing cards or try your luck with squid fishing. 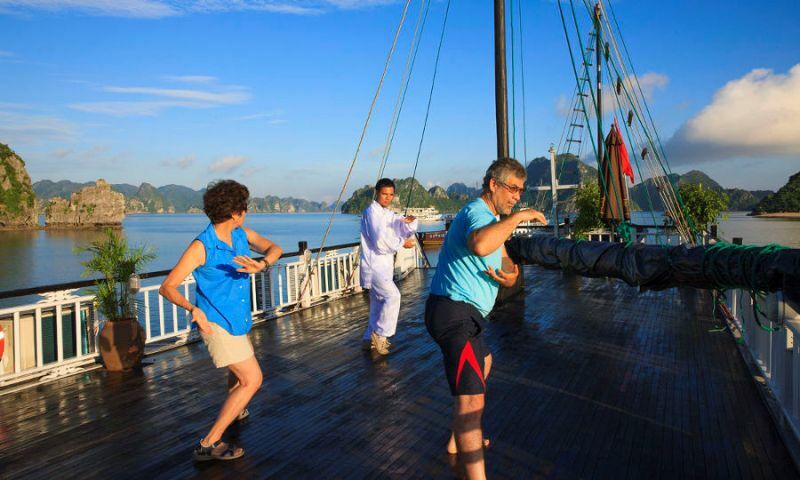 06:30 Start Tai Chi demonstration on sundeck. 07:50 Discovering cave, a natural ‘labyrinth’, made by Mother Nature. 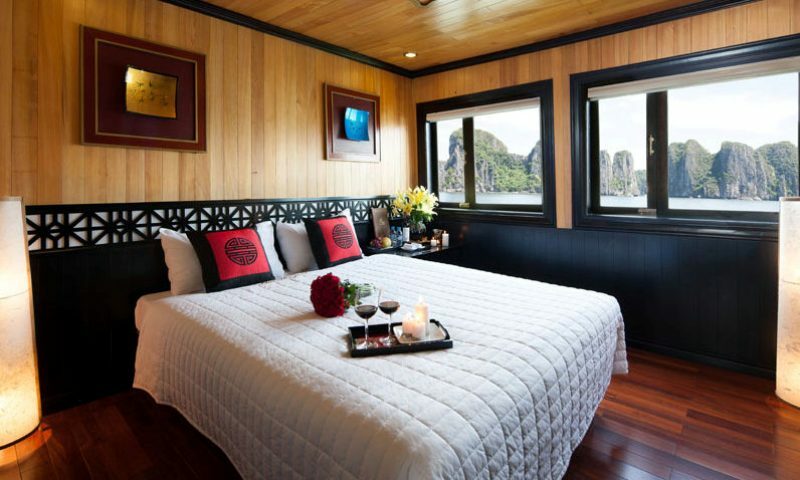 You would have chance to understand more about values of the Cave as well as Halong Bay. 09:00 Get back to Galaxy Premium then you will have half an hour to freshen up, finish packing and check out of your cabin. 10:15 Cooking demonstration with Vietnamese Traditional Cuisine - Fried Spring Roll. 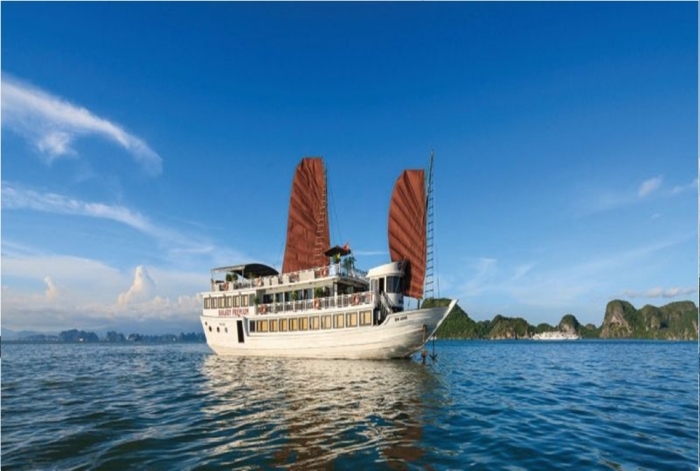 10:45 Lunch will be served while Galaxy Premium is cruising back to the pier though BAI TU LONG BAY. 12:00 Disembark in Tuan Chau pier. 17:00 Return to Hanoi. End of service. 15:30 Arrive kayaking area - Dark and Light Tunnels in Cat Ba National Park. Enjoy kayaking through the karst and breathtaking nature. Then you can enjoy swimming in the crystal water (life vests are available). 09:15 Transfer to a smaller boat, head to Lan Ha Bay. 09:00 Cruise to ‘The Frog Home’ to do kayaking through incredible limestone karst or swimming in blue and peaceful water. 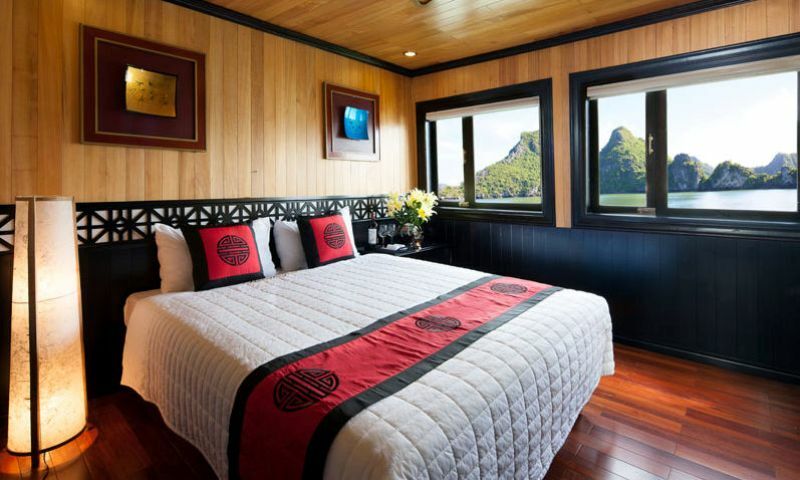 10:30 Visit the Pearl Farm - established by Japanese at the end of 20th Century. 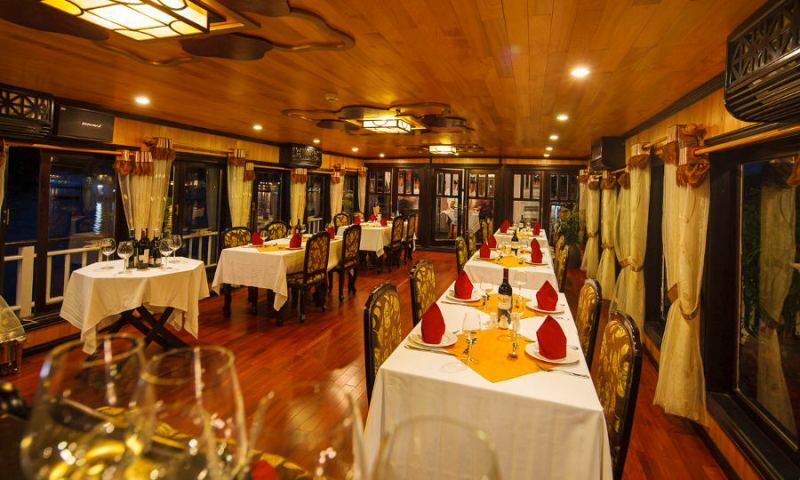 11:30 Fresh barbecue seafood lunch will be served on board while cruising to the next destination. 14:00 Reach the most beautiful islet - ‘Ba Trai Dao’, belonged to Lan Ha Bay, the untouched area for swimming or kayaking with many private beaches, you can choose one for only you. 16:00 Return Galaxy Premium Cruise. 18:00 Let’s start Sunset party on Galaxy cruise. 19:00 Vietnamese style dinner will be served. 20:30 Free time for joining Games, Karaoke or you may also try your luck with squid fishing. 07:00 Breakfast will be served in Western style and furthermore with Vietnamese traditional food. 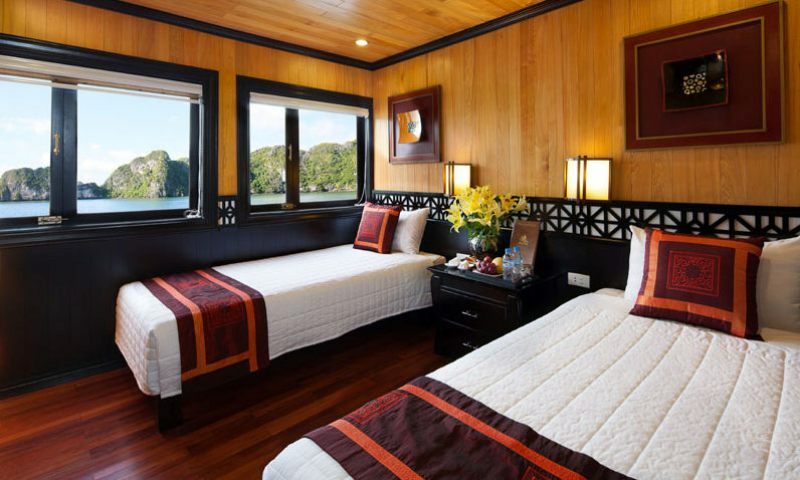 Then you are free to photo hunting, sunbath or enjoy some coffee, tea while our cruise is coming into wonderful area - Bai Tu Long Bay. 09;30 Finish packing and check out of your cabin. Prepare to join in our traditional cooking demonstration. - Guest must be ready and wait at hotel lobby from 7:45 - 8:20 because shuttle bus cannot stop long time in crowded, small streets. - The itinerary is subject to change due to the weather, tide level and operating conditions without prior notice. 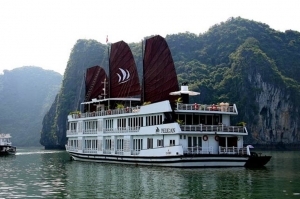 - Guests must bring real passports for overnight registration onboard.